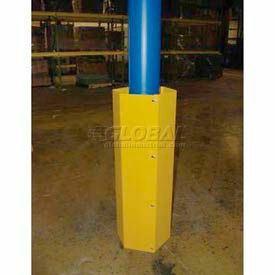 Column Protector Protects Columns And Fork Trucks From Costly Damage While Preventing Personal Injury. 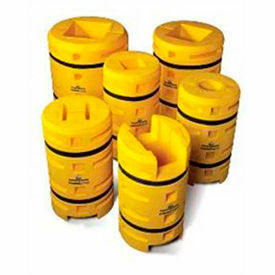 Column protectors are made with blow molded 100% high density polyethylene for long lasting durability. UV inhibitors provide excellent weather and chemical resistance. Column guards absorb impacts up to an 8,500 lb. fork truck, at 5 mph. 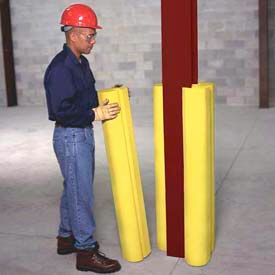 Column safety guards are stackable for added height protection and can be used on all types of columns. Installs easily. Yellow Protectors use two included nylon belts with Touch fasteners. Orange and Lime Green Protectors include two reflective straps. Column size openings are 6, 8, 9, 10 and 12 inches. Outside diameter is 24 inches. Overall heights are 24 or 42 inches. Sentry® Column and Corner Protectors Minimize Tow Motor Impact And Damage To Columns, Supports, Vehicles And Operators. 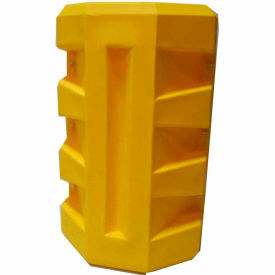 Sentry® Column and Corner Protectors are rotomolded with low density polyethylene to ensure long lasting durability. Patented air chamber and anchor bolt slots provide optimum performance. Protectors are weatherproof, chemical resistant and UV stabilized. Easy to install. 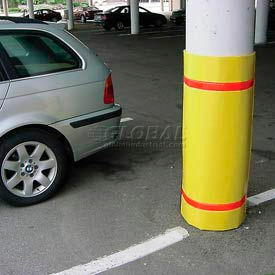 Available styles are Warning Systems, Column Protectors, Corner Protectors, Rack Protectors and more. Openings range from 1-1/2" x1-1/2" to 4" x4" and Square, Round and Rectangle up to 30" diameters. Available colors are Black and Yellow. Width and length dimensions vary per style. 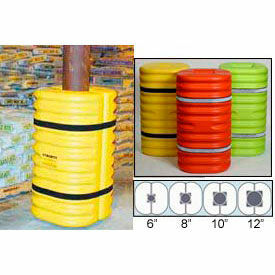 Soft Column Covers Easily Strap Over Existing Columns To Provide Increased Protection And Safety. Column wraps are made of 10 oz. nylon fabric that is rip-proof, waterproof, fade resistant and mold proof. Core is made of 1/2" thick loose cell foam. Soft column covers include two 2"W reflective stripes for high visibility. Measures 44"H. Utilizes Self Adhesive Strapss for easy attachment. 1 Year Limited Warranty. Modular design - Use one protector for each flange of I-beam. Allows installation on beams obstructed by walls or other structures. 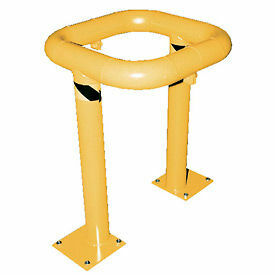 These Safety Guards Prevent Costly Damage To Steel Columns, Pipe And Tubing From Carts And Fork Trucks. Safety guards are made of 1/2" thick solid steel for maximum strength. Used for protecting fixed jibs and gantry cranes. Mounting plate measures 16 W x 13-1/2 D and includes 6 pre-drilled mounting holes. Yellow powder coat finish. Heavy Duty Column Protectors Are Designed For Protecting In-Plant Columns And Other Vertical Support Members. 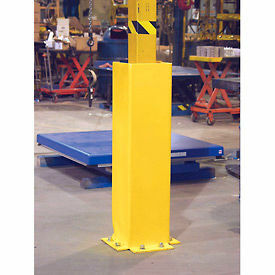 Heavy Duty Column Protectors are made of heavy duty welded steel with a yellow powder coat finish for long lasting durability. Two-piece design includes hardware to connect both pieces together. Base plate includes 4 pre-drilled mounting holes. Concrete installation hardware (Anchor Bolts) sold separately. Easy assembly. Color finish is Yellow. Sizes are 20" L x 20" W x 24" H, 20" L x 20" W x 36" H and 20" L x 20" W x 48" H. Also available is a Heavy Duty Column Protector - Hardware Kit - To Install Needs (8) Concrete Anchor Bolts. Poly Structural Column Protectors Protect Buildings And Structural columns From Collision Impact For Increased Safety. Poly Structural Column Protectors are made of polyethylene to provide long lasting durability. Two halves connect with six nylon bolts with wing nuts and install easily with no tools required. 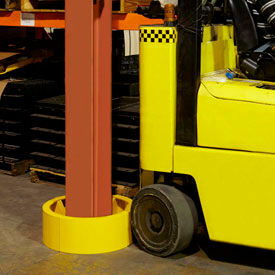 The premium column protector will absorb a 5,000 pound forklift at 6 mph and still protect the column. For use with 6", 8" and 10" Square Columns, 8" x 10" Rectangle Columns and 9" Round Columns. Color is High Visibility Yellow. Dimensions and openings vary per model. 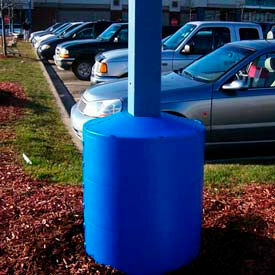 Light Post Base Covers Are Used For Protecting Both Light Poles And Vehicles From Damage. Light Post Base Covers are made of rust-proof polyethylene or plastic for long lasting durability. Tamper proof Tough-Lock System™ on some models provides additional security. Available in Black, Blue, Gray, Red, Recycled Green, Granite and Yellow colors. Available to fit 24 inch or 28-inch diameter Light Post Base. The columns of a facility are an integral part of the building and support the weight of the roof/structure, known as a vertical load. Impacts at the lower parts of columns reduce the capacity of the column to continue to support vertical loads, thus an impact to a column, known as a horizontal load, could create expensive repair work, down time and in the worst case a roof/building collapse. Unlike conventional column guarding methods, IRONguard's Column Guard stops the forklift, pallet truck, and other warehouse vehicles from impacting the column or transferring the impact load. While most other column protection methods employ a cushioning device that absorbs some of the impact shock, they do not prevent the impact. At 8" high and manufactured from 3/16" thick steel and 3/8" gussets high strength cold rolled steel, IRONguard's Column Guard can stop a 10,000lb forklift travelling at 3 to 4 MPH dead in it's tracks. The safety yellow power coat finish ensures high visibility. Column guards are supplied in quarters, making them flexible for adding around racking corners or getting around column obstructions.